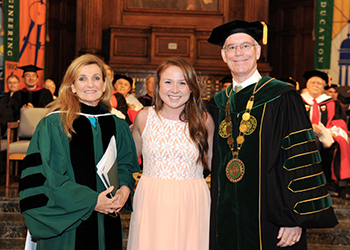 Kathleen White, a graduate of Manhattan College’s class of 2014 with a B.A. in peace studies and history, and a resident of Keansburg, N.J., was recognized with the Joseph J. Gunn Alumni Medal on May 15 at the Spring Honors Convocation. White will graduate on May 18 at the College’s 172nd Commencement along with some 750 classmates. The Joseph J. Gunn Alumni Medal is one of the College’s highest undergraduate student honors. The award is given to a graduating senior who has made a significant contribution to the College during his or her undergraduate career. Since White’s freshman year, she has remained active in the student organization JustPeace, which spreads awareness and takes action on social issues worldwide. She has served as president for the last two years, and has helped to plan and facilitate several events on a variety of human rights issues, including the usage of child soldiers, as well as the social and political situation, in the Congo, and the Harkin-Engel Protocol to eliminate child and adult labor in the growing and processing of cocoa beans. Last summer, White was accepted into the Jasper Summer Research Scholars program and received funding to conduct research with a professor on the role of NGOs in South African education. Throughout her four years at the College, she was active in the following honor societies: Phi Beta Kappa (liberal arts and sciences), Epsilon Sigma Pi (the oldest College-wide honor society), and Phi Alpha Theta (history). She also worked with the College’s Campus Ministry and Social Action department, the Center for Academic Success, and the Holocaust, Genocide and Interfaith Education Center. In addition to White’s passion for social issues, she is committed to helping others through the College’s Lasallian Outreach Volunteer Experience (L.O.V.E.). L.O.V.E. offers service and social justice immersion experiences, and White participated in two trips to Jamaica to work with a community orphanage for children with severe disabilities. She also acted as a mentor and tutor for prisoners in a Criminal Justice Ethics course at Rikers Island. After graduation, White will spend the next year with the Jesuit Volunteer Corps as an outreach coordinator at the Campaign for the Fair Sentencing of Youth in Washington, D.C.
“I’m really excited to be working with the Jesuit Volunteer Corps because it’s an opportunity to focus directly on service and social justice while living simply with other like-minded individuals,” White said.